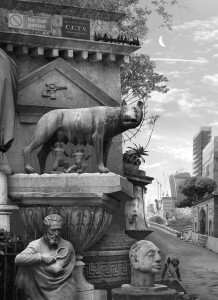 This series, largely inspired by Giovanni Battista Piranesi’s fantasy compositions of Rome, forms a dialogue between Italy and the UK, taking on the tradition of the Grand Tour. 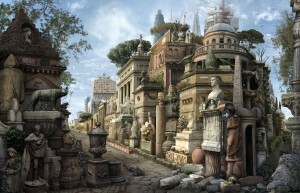 Works such as Sic Transit Gloria Mundi (after Piranesi) are epic in ambition and detail. 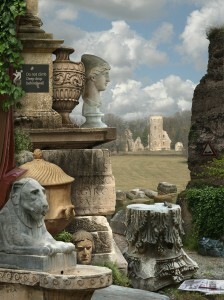 A reworking of Piranesi’s popular etching ‘Imaginary View of the Ancient Intersection of the Via Appia and Via Ardentina, Rome’ (1756) Allchurch’s vision is constructed from architectural fragments of antiquity she photographed in Rome, intermingled with those of London’s past, present and future. Seated within the artistic tradition of ‘ruin lust’ (the seductive quality of ruins), the artwork is a reminder that empires can collapse, in both a celebration of, and a warning about, architectural hubris in today’s capital. 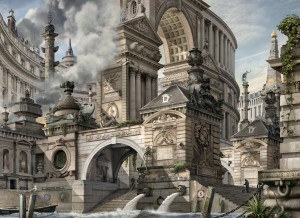 In Capital Folly (after Piranesi) (2017), Piranesi’s imaginary vision of a Roman harbour is recreated from real architectural details around the centre of government in Whitehall, London and Liverpool. 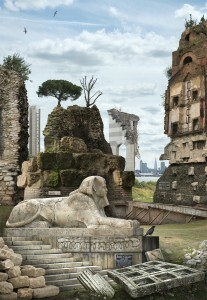 The first and second cities of the British Empire, the piece references Britain’s maritime history throughout. Whilst the soaring composition presents an impressive citadel, closer inspection, as evidenced by the smouldering pyre to the left, heralds potentially troubled times ahead, with political and economic uncertainty, and growing inequality of wealth. 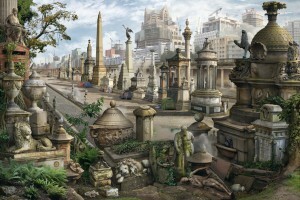 The inclusion of memorials to Heroic Self-Sacrifice (Postman’s Park, London) and the Engine Room Heroes of the Titanic (Pier Head, Liverpool) is testament to the determined courage of individuals, but the fact that the ill-fated liner was not equipped with sufficient lifeboats to save all those on board, in spite of that courage, can be seen as a metaphor for the plight of many today. 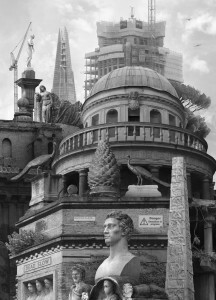 Ghost Towers (after Piranesi) (2018) covers similar territory to Sic Transit… using the rubble of past empires as a warning against architectural hubris. However, in this version, all the imagery is from the UK, and the focus is about housing in our cities: with new-build luxury apartments lying empty (ghost towers), as the rich overseas investors they were built for turn their backs on the UK in the uncertainty of Brexit, alongside the ongoing struggle for would-be-first-time buyers to find an affordable home, and the rise in homelessness.